The PowerMedia XMS MRF/MRB enables service providers to functionally decompose voice and video media processing for more efficient utilization and scaling across multiple customer applications. Dialogic announced today that TMC, a global, integrated media company, has awarded Dialogic PowerMedia XMS MRF/MRB a 2016 INTERNET TELEPHONY NFV Pioneer Award. Dialogic® PowerMedia™ XMS media processing platform can be deployed as a composite Virtualized Network Function (VNF) to provide both Media Resource Functionality (MRF) and Media Resource Broker (MRB) services in IMS, VoLTE, NGN and cloud environments. The PowerMedia XMS solution supports extensive media processing capabilities and is used by service providers and application developers to enable next-generation rich media and value added services. The INTERNET TELEPHONY NFV Pioneer Award honors products that have demonstrated innovation, unique features, and noteworthy developments toward improving Network Function Virtualization. 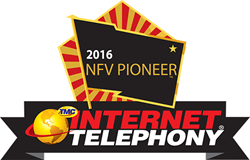 Winners of the NFV Pioneer Award will be featured in the June 2016 issue of INTERNET TELEPHONY magazine. Visit the PowerMedia XMS to find out more about its capabilities. Dialogic is a leading cloud-optimized solutions provider for real-time communications media, applications, and infrastructure to service providers, enterprises, and developers around the globe. Based in Parsippany, NJ with offices worldwide, Dialogic helps 48 of the world’s top 50 mobile operators, and nearly 3,000 application developers build and deploy on agile networks. Learn more about how Dialogic is enabling agility by following us on Twitter @Dialogic, and visiting http://www.dialogic.com and the Dialogic Blog for the latest industry news, trends, and advice. Dialogic and PowerMedia are either registered trademarks or trademarks of Dialogic Corporation or an affiliate or subsidiary thereof (“Dialogic”). Other trademarks mentioned and/or marked herein belong to their respective owners. INTERNET TELEPHONY magazine has been the IP Communications Authority since 1998™. Beginning with the first issue in February of 1998, INTERNET TELEPHONY has been providing unbiased views of the complicated converged communications space. INTERNET TELEPHONY offers rich content from solutions-focused editorial content to reviews on products and services from TMC Labs. INTERNET TELEPHONY magazine reaches more than 225,000 readers, including pass-along readers. For more information, please visit http://www.itmag.com. For more information about TMC, visit http://www.tmcnet.com.